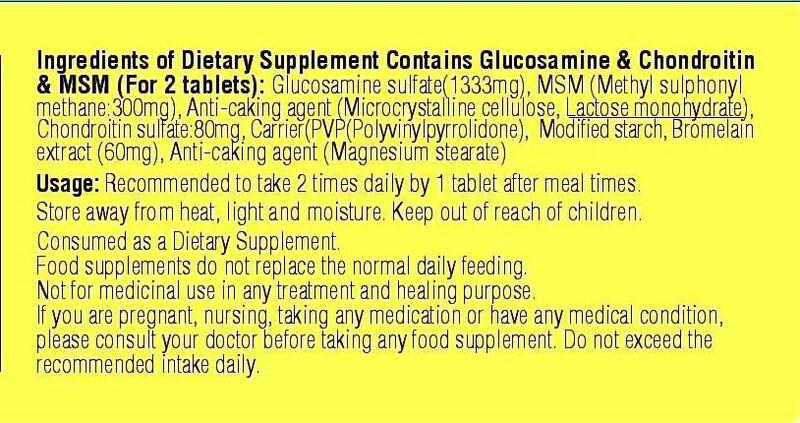 Recommended to take 2 times daily by 1 tablet after meal times. Osteoarthritis (calcification) is seen with the advancing ages especially at knees and hip joints. 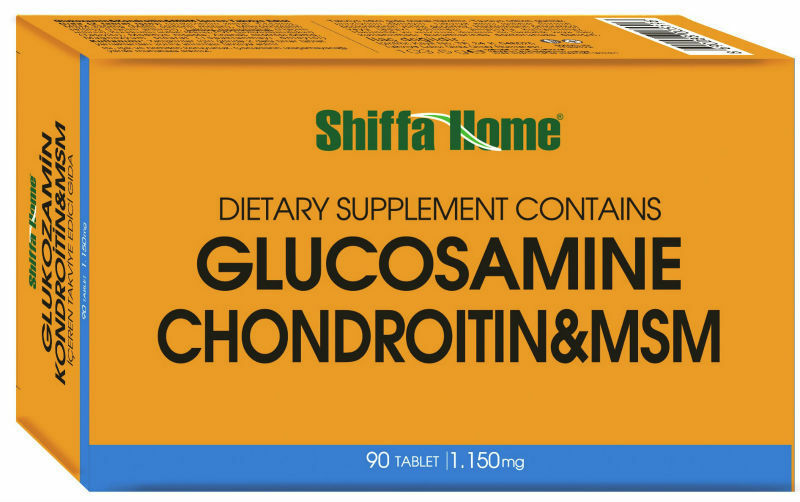 This formula developed with Glucosamine, Chondroitine, MSM and pineapple extract, has a supportive role to decrease the arthralgia (joint pains), to improve the cartilaginous tissue and decreasing the complaints about back pain which is caused by osteoarthritis. 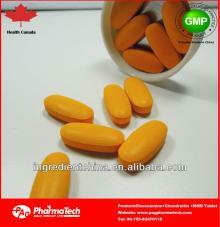 Pineapple extract, can assist to decrease the pain during infection and physical injuries and injuries of sports. Additionally, it can be used for supportive purposes to disintegrate the fibrins causing thromboses in blood vessels. 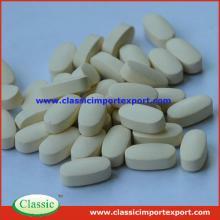 Chondroitine is produced by purifying the extract of cartilage of dog fishes, and in no manner contains pork and pork products. 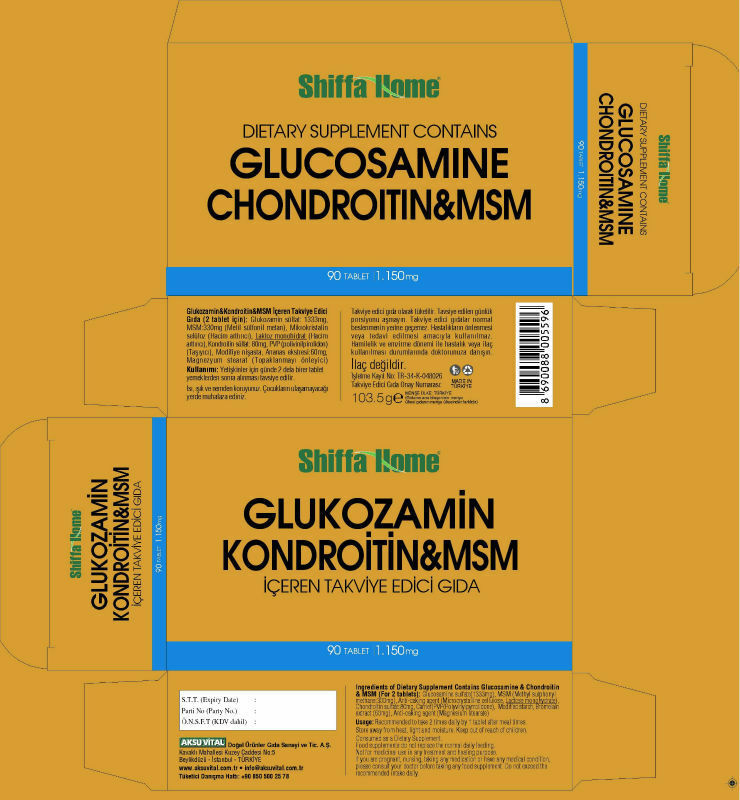 Chondroitine is an important substance for replenishment of cartilaginous tissue, bones and tendons. Particularly it is possible to recommend to be used as supportive for decreasing the pains caused by osteoarthritis and enforcement. 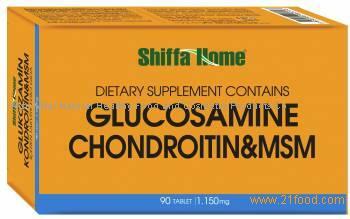 Glucosamine in its content is a significant agent for developing of the cartilaginous tissue of the body. 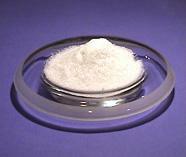 Corn starch Glucosamine is not allergen comparing with the sea shell Glucosamine. MSM known as organic sulphur source, may assist the development of the muscle and skeleton functions and also collagen formation. Pineapple extract which is obtained by purification of pineapple, can assist to decrease the pain during infection and physical injuries and injuries of sports. 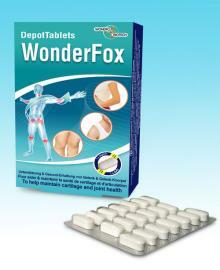 Recommended to take 1-2 tablets daily , preferably after the meals for adults. 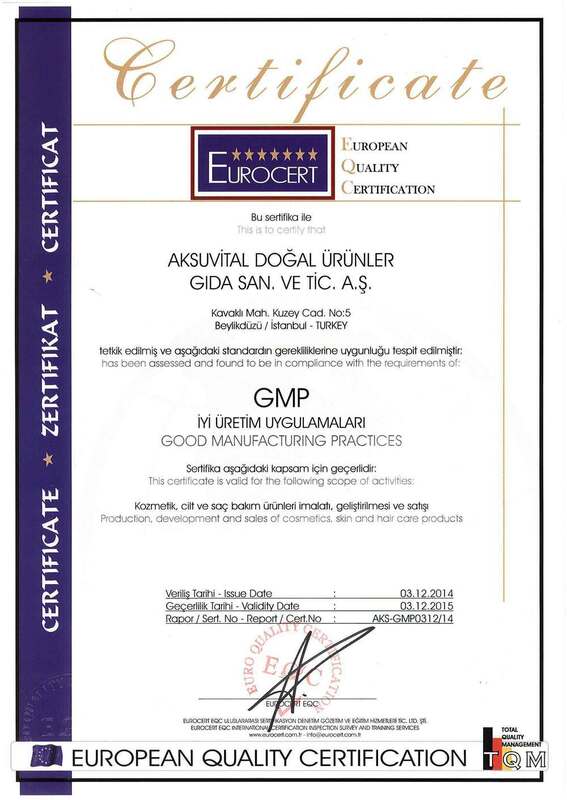 Name of the Company AKSU VITAL NATURAL AND HEALTHY FOOD & COSMETIC PRODUCTS CO.
Year of Foundation 1989 Production Site (M2) : 10.000 M2 Covered Area. 2) Molasses : Grape, Mulberry, Carob Molasses Juniper and Apricot Molasses , Date Molasses etc. 3) Herbal Teas : 7 functional herbal mixed teas and 16 single herbal teas. 4) Other items: Vitalest gel and herbal mixtures for sportmen , New ones coming soon. 2) Apicultural Products : Unadulterated Creamy Royal Jelly , Untreated Bee Pollen in Granules , Bee Propolis. 3) Herb+Spices+Honey Mixtures : Power Pastes for adults & Kids. Honey+Bitter Melon+Some Herbs Mixture (especially for gastritis , stomach patients) for Bronchitis & Hemorrhoid complaints , Weight-controle Paste etc. 4) Vitality Products : Honey+Pollen+Royal Jelly+Ginseng+Propolis Mixtures for Men , Women and Kids. 6) Ground Products : Ground Grape Seeds , Flax Seeds , Nettle Seeds , Nigella Seeds , Milk Thistle , St. John's Wort etc..
3) Syrups & Sprays : ProViteC syrup for immune system , Omega 3 Syrup , MultiVitamin Syrup for kids , FerroViteC syrup , Rose Water Spray , Lavender Water , Rosemary water Spray , Jasmine Flower Water Spray. 6) Creams : Care creams with Honey & Royal Jelly , with Blue Anemon , with Apricot oil , with Almond oil and Synake Eye Contour creams , Grape seed cream , Snail cream , Calendula Cream , Limon kernel oil-Cream , Day care cream. 7) Shampoos : Care Shampoo with Honey & R. Jelly , Shampoo with Olive and Daphne oil , Nettle & Garlic Shampoos. Main Export Items Honey Group , Nutritious Power Pastes , Slimming Products , Mixtured Nuts with Honey , Molasses , Apicultural Products , Honey+R.Jelly+Polen Mixtures , Aromatic Water Varieties , Pomegranate Sauces , Herbal Teas , Pharmaceutical Products such as Syrups , Capsules &Tablets, Natural Aromatic and Massage Oils , Creams , Soaps , Shampoos. Main Export Markets Germany , England , Libya , USA , Algeria , Jordan , U.A.E. , S.Arabia , Poland , Canada , North Cyprus , Kuwait , Iraq , Azerbaijan , Holland , Tunisia , Yemen , Australia , France , Malaysia , Bahrain , Qatar , Russia. 5 ) BEAUTY WORLD COSMETIC EXPO in Dubai / U.A.E. 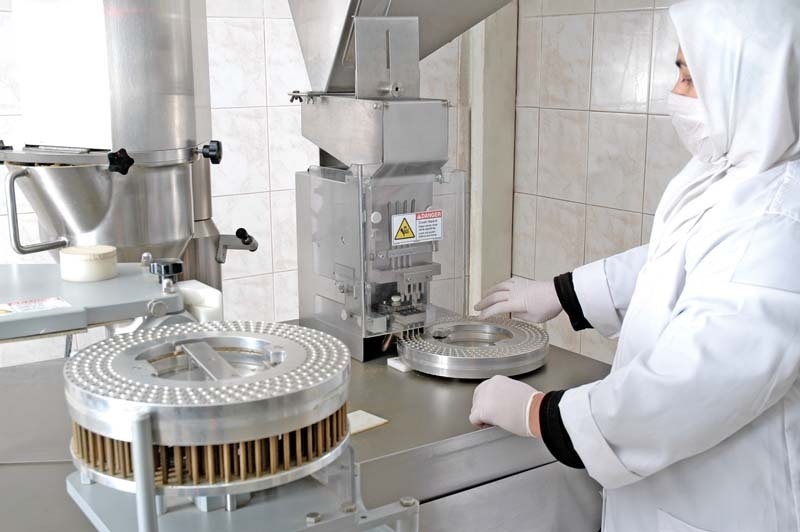 3 ) HACCP (Hazard Analysis of Critical Control Points) by WCS. 4 ) International Gold Star For Quality by Business Initiative Directions (BID) in 2002. 5 ) FDA No : 18806943380 (Food and Drug Administration of USA). 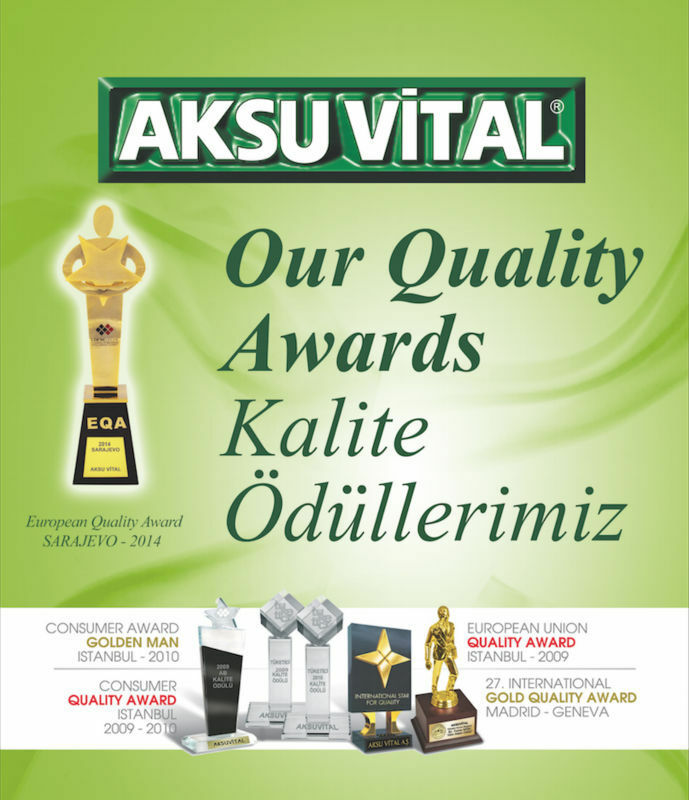 Our Brands AKSU VITAL : Generally used for basic products. 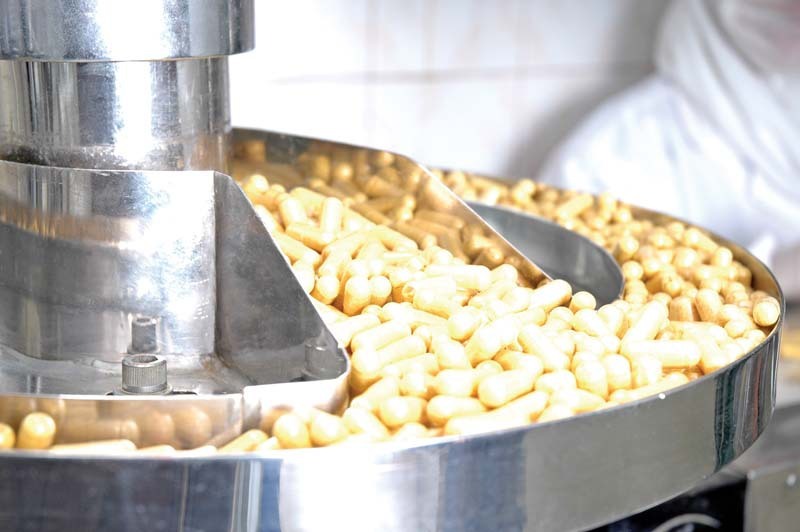 AVICENNA : Food & Nutritional Supplements in Capsules , Tablets and Syrups for Pharmacies. 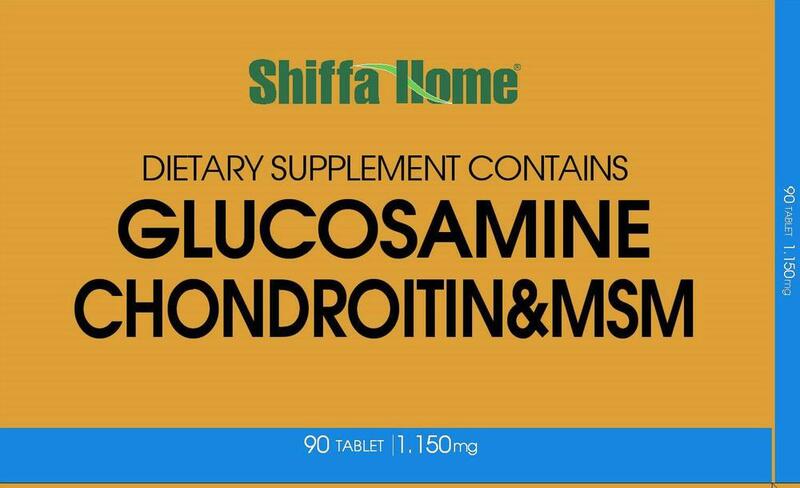 SHIFFA HOME : Tablets,Capsules&Aromatic Oils for Herbal & Spice Selling Shops&Pharmacies and herbal teas. SOFTEM : For personal care creams , soaps , shampoos and massage oils. 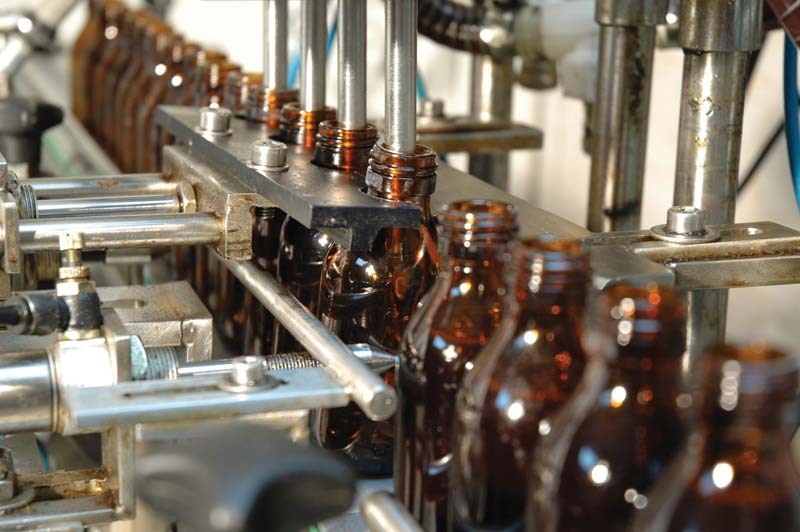 Commercial Presence in the Local Market Aksu Vital has 40 distributors in countrywide. 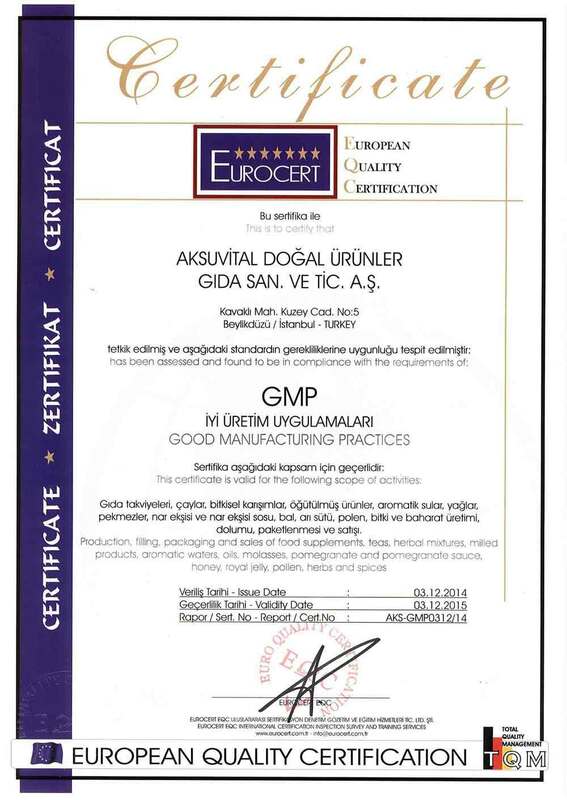 Additionally , Aksu Vital Natural & Healthy Products can be easily found at more than 3500 sales points throughout Turkey , including Cosmetic and Health Stores , Herbal and Pharmacy shops. 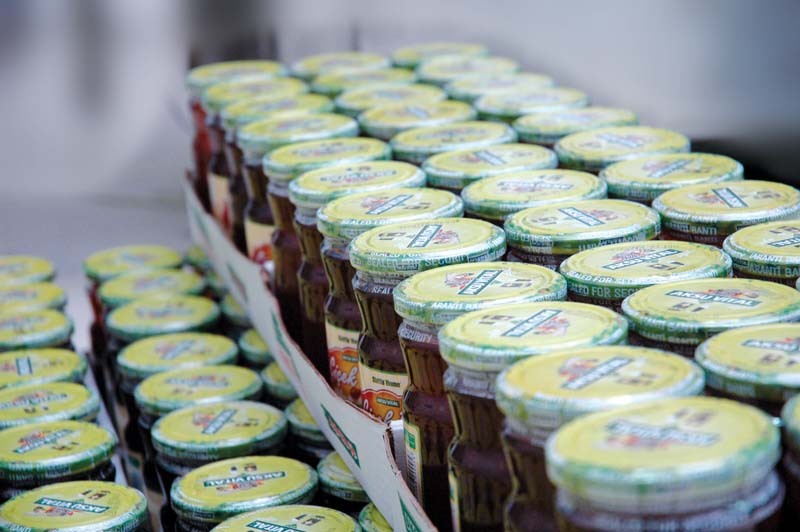 We can develop your private label. OEM service available. Please contact for more details.